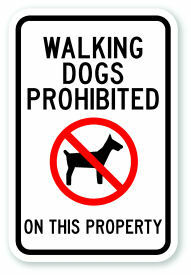 Insuring extended sign life, "Walking Dogs Prohibited On This Property" is made from Heavy Duty .080 Aluminum for pole mounting or Standard Duty .040 Sign for fence or wall mounting. All signs come with Standard 3/8" Mounting Holes centered Top and Bottom. Most signs are available in your choice of RED, BLUE, BLACK or GREEN on white background. Each has a reflective sign face option achieved by applying 3M HIP reflective material. The sign is very well made. It is sturdy. The coating on the sign makes cleaning it very easy. We would recommend this to anyone who is looking for one. Absolutely give it 5 stars.